Thirty years ago on June 5th 1981 a medical journal documented a mysterious illness that had killed 5 men in Los Angeles. World Aids Day which began in 1988 has been observed around the world to commemorate those who have died from the disease & also to raise awareness & funds for research into a possible cure & treatment. More than 90,000 people are currently living with HIV/AIDS in the US & globally an estimated 33.3 million people have HIV. More than 35 million people between 1981 & 2011 have died from the virus, making it one of the most destructive pandemics in history. Today many scientific advances have been made in HIV treatment, there are laws to protect people living with HIV & we understand so much more about the condition. But despite this people do not know the facts about how to protect themselves & others from HIV & the stigma & discrimination remain a reality for many people living with HIV. 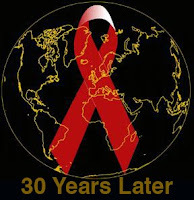 World AIDS Day is important as it reminds the public & Government that HIV has not gone away. There is still a vital need to raise money, fight prejudice & improve education. Please Get Tested!! This time of year always conjures up conflicting emotions for me. It’s a season of much joy and celebration. But the commemoration of World AIDS Day every December 1 is a somber reflection on how many -- and how much -- we have lost to the epidemic. Still, we’ve made incredible progress over the last 30 years -- progress that was not in sight when the struggle against AIDS began. As we enter the fourth decade of this epidemic, we have an incredible opportunity to make HIV infection rare, and to ensure that everyone affected is supported with treatment and care.